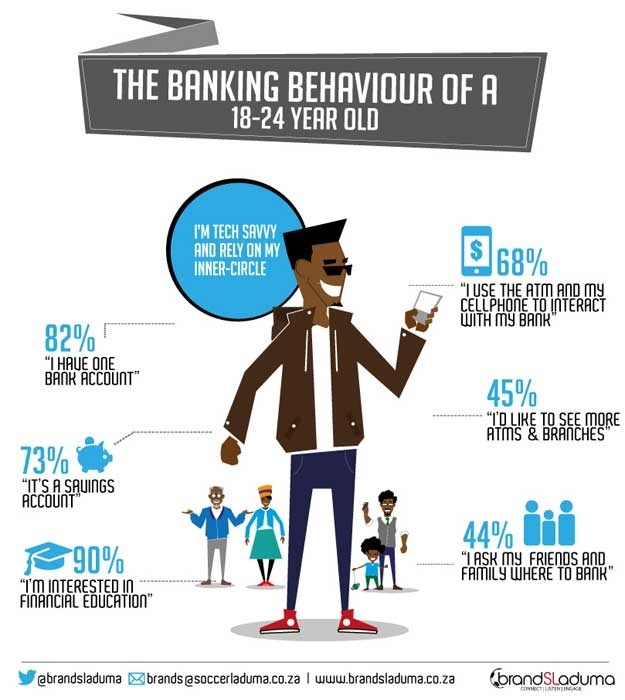 Cape Town – Banks should be aware of the fact that "Ubuntu Millenials" turn to their families for financial education, and not neglect good, old-fashioned customer service, according to a brand expert. Piet Geustyn, Brands Laduma research manager, told Fin24 that families and communities are positive for young South Africans, given that they use them to find out where to bank. Geustyn recommends that banks be aware of this and not neglect good, old-fashioned customer service across the board, “because the older customers will pass on their brand experiences to the youngsters in their lives”. 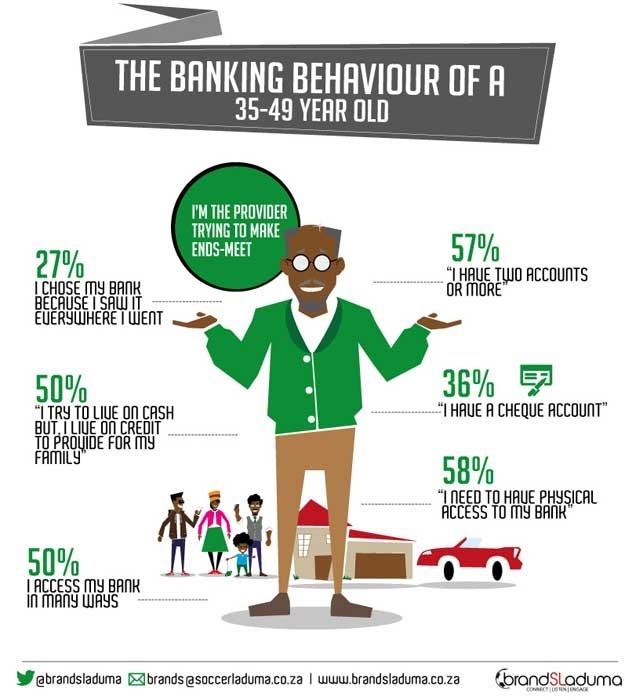 A Brands Laduma survey found that while the 18 to 24 year category showed a 44% inclination towards using their peer and family groups to assess available financial products, and the 25 to 34 year category showed a greater financial awareness, across both age groups, the need for greater financial education measured at a significant 90%. “Our survey shows that young people will often start off with a bank that offers the cheapest fees, then migrate to one at another bank if it offers better benefits and rewards, as they grow older and earn more money. The idea that people are loyal to their banks and won’t move is not quite true,” said Geustyn. The need to equip people to make good financial decisions made even more sense as people got older, continued Geustyn, since up to 50% of people older than 35 years regularly used credit to buy necessities like food and clothes to support their families. “We conducted the research right across the country amongst our community members who have mobile and online access. The 18-question survey took just five minutes to complete and we saw very good participation rates for this kind of exercise, with an 88.3% completion rate,” said Geustyn. According to Geustyn banks can tailor their financial offering based on the age group of the client. “There is an opportunity for a flexible account that ‘grows’ with its user – from a very basic account with next-to-nothing fees when they are young, to a complex offering linked to multiple products, credit and rewards as their needs diversify. It is about making the products suit the lifestyles of people,” he said. 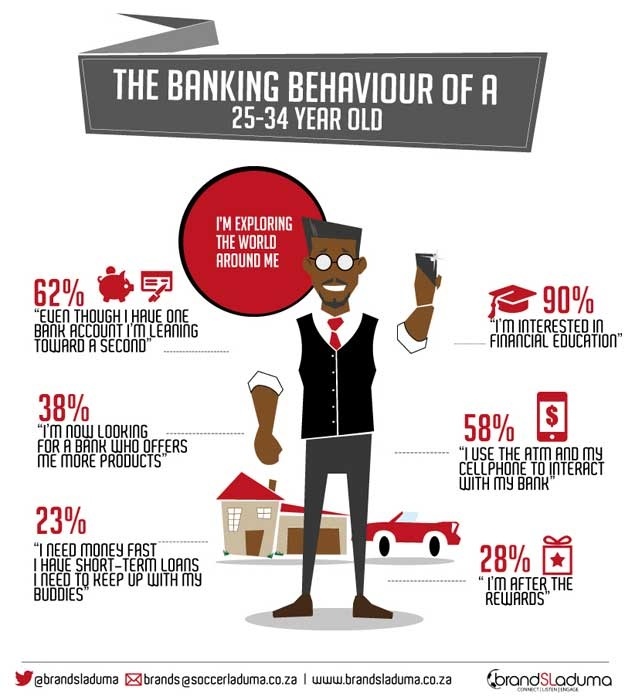 “Given that 41% of adults between the ages of 18 and 34 still see branches as a good place to bank, digital channels should perhaps be an aid to the on-the-ground banking experience, and not be regarded as a replacement. “It goes without saying that banks should have websites and mobi sites that have all the relevant information, but these digital tools should also make it easier for people who want to visit a branch or speak to a consultant. No matter what age they are, people still appreciate human contact,” he said.